Met Opera on Demand delivers instant and unlimited streaming of more than 600 full-length Metropolitan Opera performances on your Android smartphone or tablet, and on your HDTV or connected sound system as well with Chromecast. More than 100 presentations from the Met’s award-winning “Live in HD” series of global cinema transmissions featuring opera superstars, more than 400 radio broadcast performances dating back to 1935, and classic Met telecasts dating from 1977, it’s just some of the content you can find in this app. 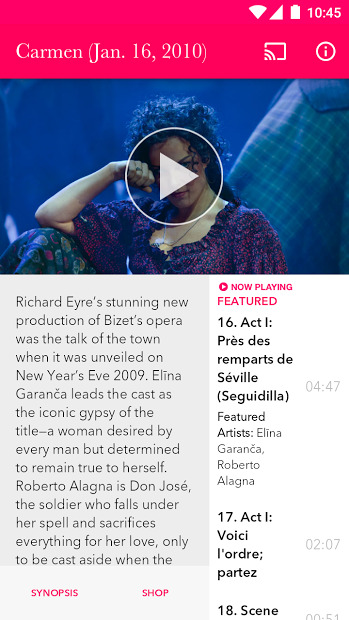 Note: The Met Opera on Demand app is free to download. Explore the app and the catalog, and enjoy a sampling of free preview content. 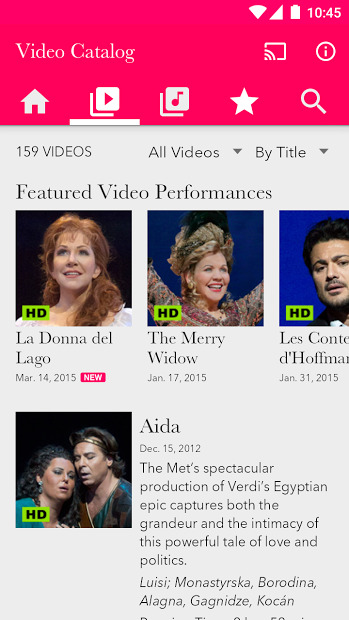 Met Opera on Demand subscribers can sign in anytime for complete and unlimited access to everything available. Free 7-day trial available for new users. Many languages and subtitles available.